"With a presence in over 72 countries and regions, Sheraton is an exciting addition to the fast-growing hospitality scene in the Philippines," said Mike Fulkerson, Vice President, Brand & Marketing Asia Pacific, Marriott International. 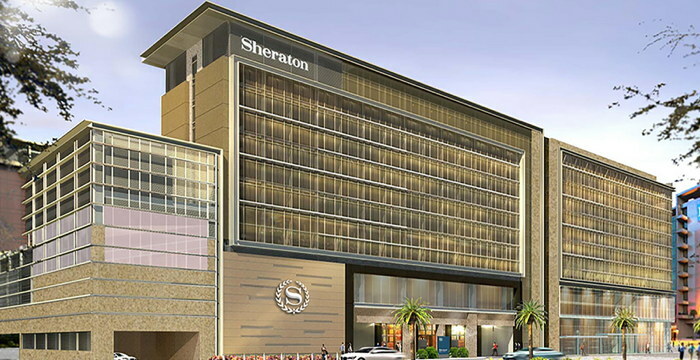 "The brand is trusted and recognized by travelers globally and we are confident that the new Sheraton Manila will gather travelers together and connect like-minded people for business or leisure." Located at the forefront of the world-class integrated complex, Resorts World Manila, the hotel is the first landmark seen upon arrival at the Ninoy Aquino International Airport Terminal 3. Major roadways leading to Manila's top business and cultural sites are just a few steps away. This strategic location allows sweeping views of endless city horizons in a resort-like oasis where guests experience seamless convenience and comfort. The multi-faceted leisure facilities will inspire guests to explore beyond their rooms, including the 24-hour SheratonÒ Fitness; Shine Spa with six relaxing treatment rooms and an extensive spa menu to pamper and soothe stress away; a Kids Club offering educational programs and a SheratonÒ Club executive lounge. There's also an expansive heated outdoor pool, as well as a children's pool and jacuzzi for guests of all ages to enjoy. The Sheraton Manila will cater to today's business travelers by being the first in the country to have a co-working space located in a hotel. The ColLab will be a modern hi-tech hub featuring six private rooms and an expansive 415 square meter common area. It is designed to be a conducive venue for product launches, networking events and other creative gatherings. This is in addition to nine other meeting spaces, including a ballroom that can accommodate up to 570 people. "It is our commitment to convey that authentic and heartfelt Filipino hospitality to our guests through our amenities, cuisine and services," said Anna Vergara, General Manager of Sheraton Manila Hotel. "Our vision is to be the preferred place for people to gather as they indulge in experiences in the hotel. Being located in close proximity to the international airport, we will be their home, connecting travelers to the rest of Manila.